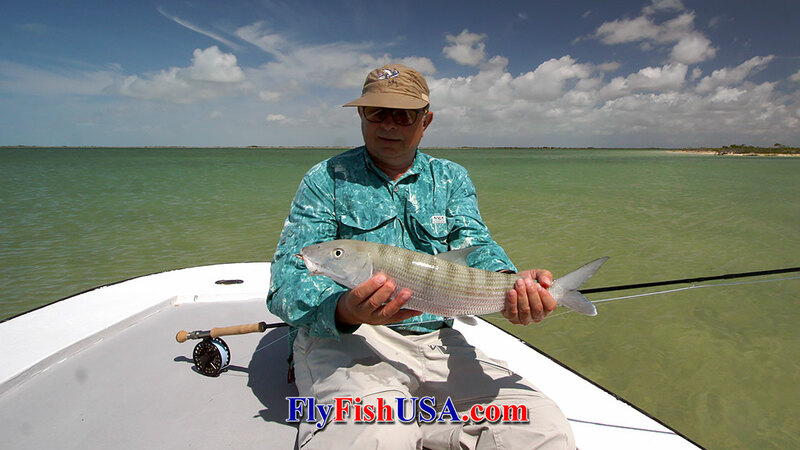 Bonefish are one of the most popular saltwater game fishes. There are a number of good reasons for this. They live in shallow water where sight fishing is the normal approach, they readily eat well presented smaller flies, they are just a little larger than average size trout, and they are incredibly strong and fast when hooked. Bonefish live in the tropics and sub-tropics, preferring water temperatures from 75-83 degrees. This often results from air temperature that is only a little higher, which means that lightweight clothing and wet-wading are normal. 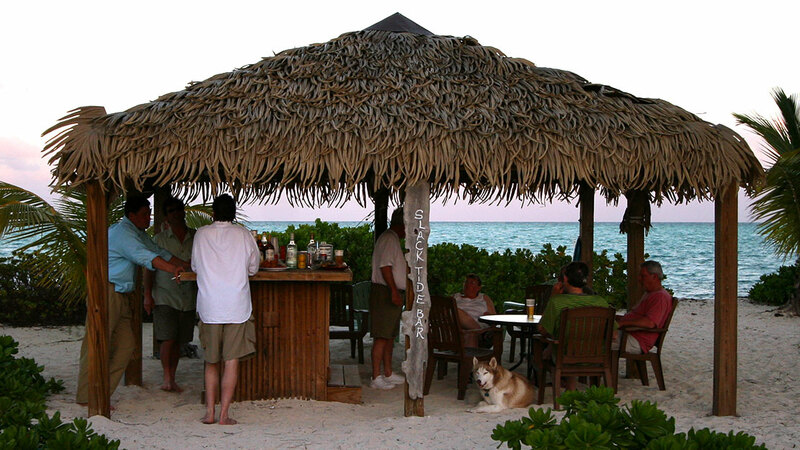 Bonefish are residents to many beautiful areas that are perfect for winter vacations. 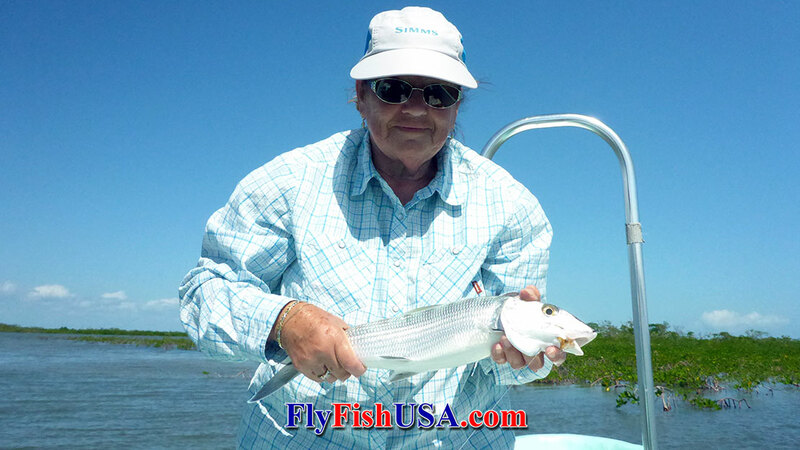 Patty and I have fished many different places for bonefish. A bonefish vacation during the winter can be a re-energizing experience; a great way to replenish vitamin-D..
Andros South Lodge is located on the southern end of Andros, the largest island in the Bahama Island chain. This places it south east of the southern tip of Florida, about half way to Cuba. Their fishing season is from October through June. This lodge is conveniently located to fish expansive flats and a system of tidal creeks. Both sides of the huge island are accessible from the lodge. 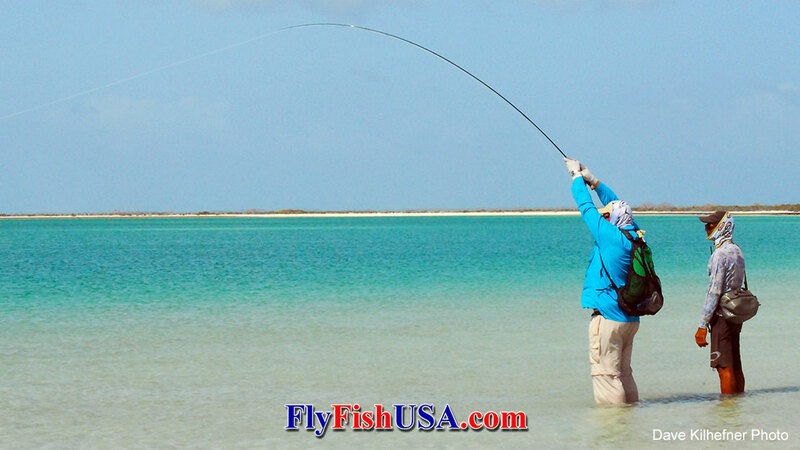 Andros is known for very large bonefish. Some may exceed ten pounds and these larger fish often prefer larger flies. For this reason #8 and #9 weight rods are recommended. 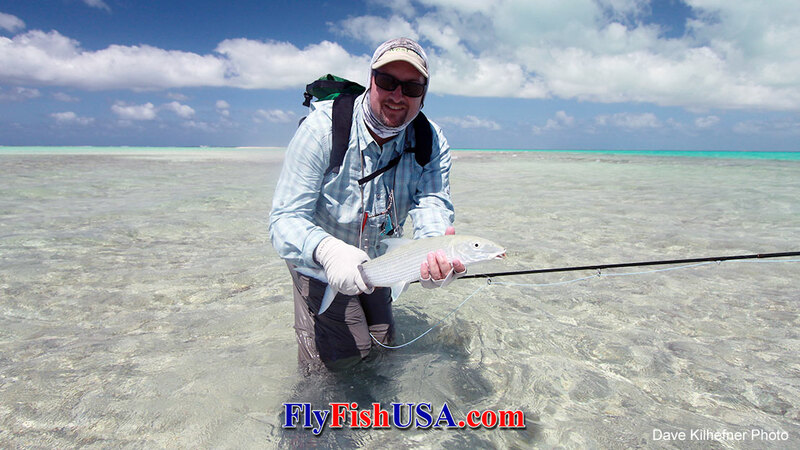 Check out the Bonefish Buttah, which is on of the favorite flies at Andros Island. Our last trip to Andros was in mid February, and fishing was great. Because there are tidal creeks there is always areas available to find shelter from wind. Andros is not the most opulent, nor the most expensive fish camp in the Bahamas, but the food, lodging, equipment, and guides are excellent. Owned by Deneki Outdoors, Andros South is located in the settlement of Kemp’s Bay on the eastern shore of South Andros Island in the western Bahamas. South Andros is the southernmost portion of Andros Island, the largest and least-inhabited island in the Bahamas. South Andros is flanked to the east by The Tongue of the Ocean, a deep-water trough that drops to more than five thousand feet not more than a mile offshore. Along the edge of the drop lies the third largest barrier reef in the world. South Andros Island itself is riddled with innumerable tidal creeks and inland flats, all home to hundreds of thousands of hungry bonefish. Check out Deneki Outdoors web site. 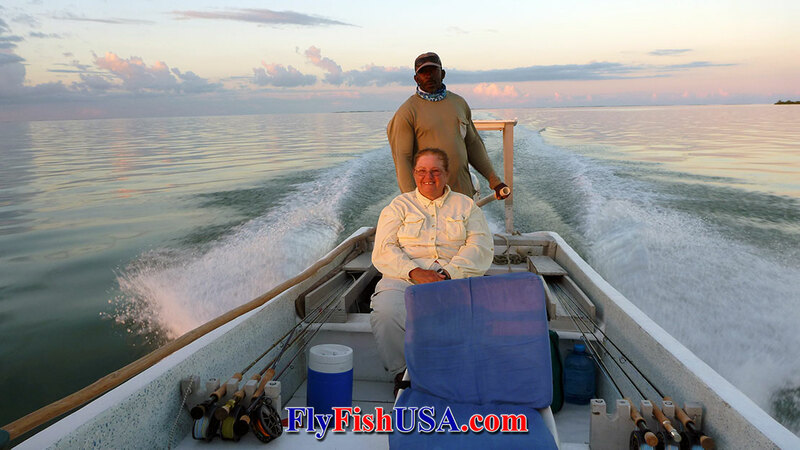 Patty and I have spent somewhere around 150 fishing-days in Belize since 1982. There are several reasons why we love Belize. Being part of the British Common Wealth, English is the national language, which makes it easy to communicate.Money exchange rate is easy: temp-One U.S. dollar -$2= two Belize dollars. Everyone can figure that out and it has been the same for the entire time we have been going there. 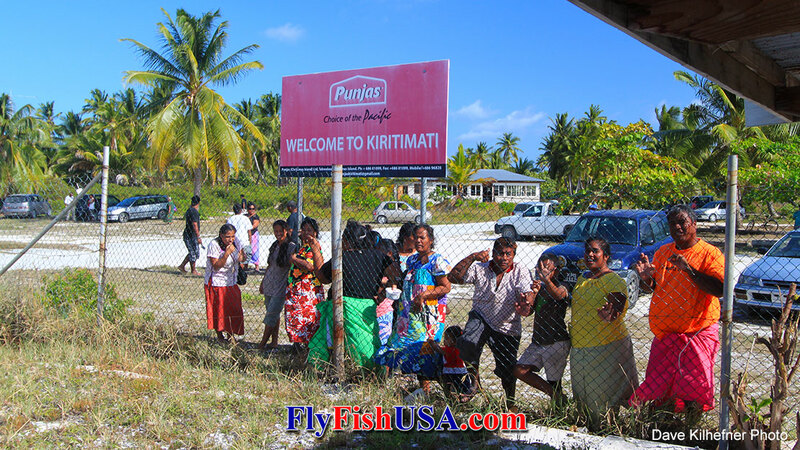 Belizians welcome tourists and honor their fisheries with very good management. In 2008 passed a law that the only legal way a person can possess a bonefish, tarpon or permit is for catch and release angling, which got rid of all the gill nets and fish traps. Since then their fishery has rebounded, and is once again world class. Belize River Lodge owners, Mike and Marguerite were instrumental in getting that law passed. Belize River Lodge is the easiest fish camp to get to in the whole country of Belize, being only about 10 to 20 minutes from Belize International Airport. There will be a person with a modern SUV pick you up at the airport, drive you to a dock on the Belize River where a boat will be waiting, and in another 10-minutes you will be at the lodge where your lodge will be taken to your room, while you are sipping a cold drink in the sun-room. 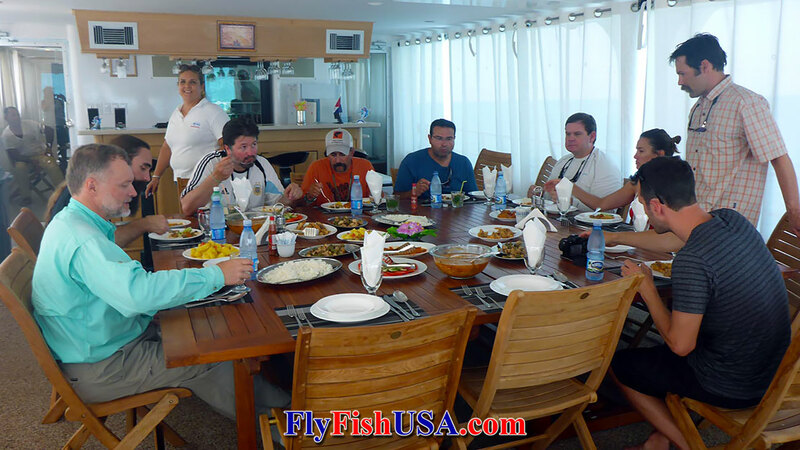 Belize River Lodge is the most efficient, most reliable opperation of its type we have ever experienced. No snafus, no drama, no sweat, no anxieties. The fishing territory of Belize River Lodge is huge, encompassing many acres of flats, and many miles of shorelines, which are unique and varied, as are the fisheries. 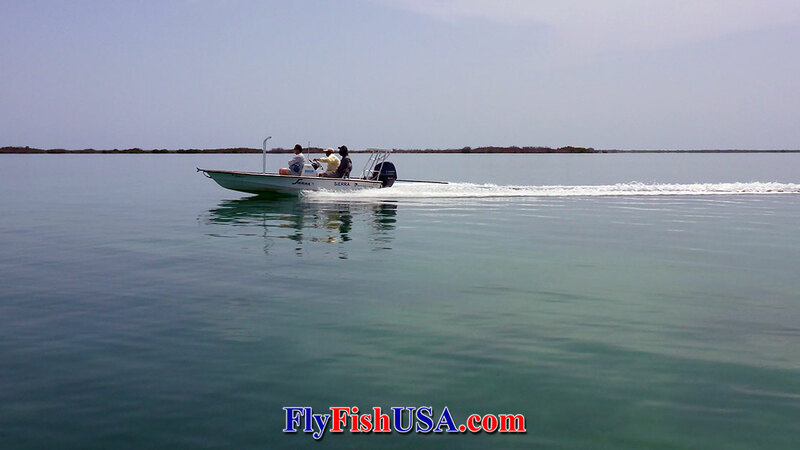 There are bonefish, permit, tarpon, snook, barracudas, snappers and jacks. The lodge is only a few minutes from the airport, but it is completely segregated from the city. It is easy to get out of the wind, which can be a problem in most destinations during the winter, because it is located on the river, which is bordered by huge jungle trees. Snook and tarpon of many sizes abound in the Belize River drainage. Belize bonefish are normally on the smaller size, but very plentiful. Most are from two to five pounds and are a hoot on 6/7 weight gear. If Belize has its drawbacks, it is the diversity of its fishery, which can vary between two pound bonefish to tarpon over 100-pounds. Contact Belize River Lodge. Before the term bucket list went mainstream, I wrote “go to Christmas Island someday” on a piece of paper and shoved it in a drawer to keep the dream alive while I worked to raise a family. Photos in magazines captured my imagination; exotic fish taking flies set amongst the whitest beaches and bluest skies on earth. That dream slumbered for a long time, then luck came knocking one day; an outdoor writer friend got an assignment to do a story and there was room for a backup photographer and would I like to go? Yes, yes, yes! Flights were booked, websites read with intensity and I wondered if I’d have what it takes to catch a nice bonefish on a fly. We stayed at the Ikari House in London, the capital town. 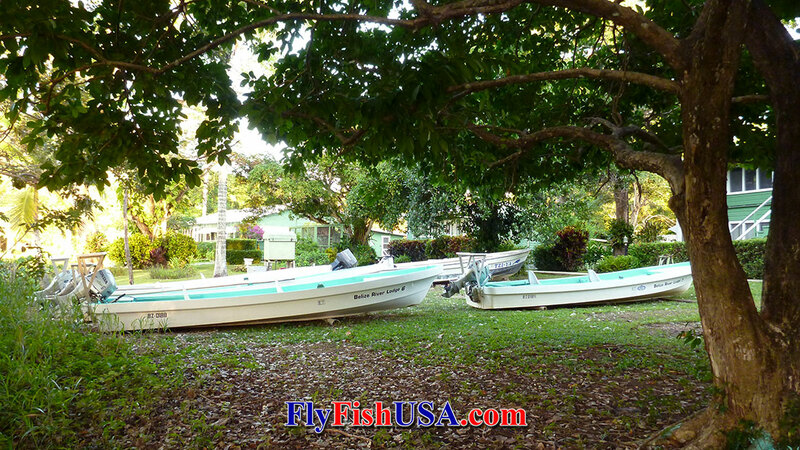 It’s located right on the beach and very close to the boat harbor. “Ikari” is a fitting name; it means bonefish in Gilbertese, the local language. It turns out if you go to Christmas Island and can make a cast that hits the water twenty or thirty feet from your sunglasses you’ll catch bonefish, probably lots of them. When the bonefish are biting, fishing is really, really good. At least once a day, the bonefish are in a biting mood! 20 plus fish days are the norm and 60 fish days are possible. Fly selection is simple; if the water is shallow or you are hanging up, use a #6 or #8 Chili Pepper with bead chain eyes and if it’s a little deeper, use a #6 Orange Christmas Island special, which has metal eyes. Leaders are simple too; 10 feet of 20lb Fluorocarbon tippet. If the fish are spooky, knot 3 or 4 feet of 15lb FC tippet to the end of this and you’re all set. Bone fishing on Christmas Island sounds almost too easy but without my guide, Moana, I would have been lost. 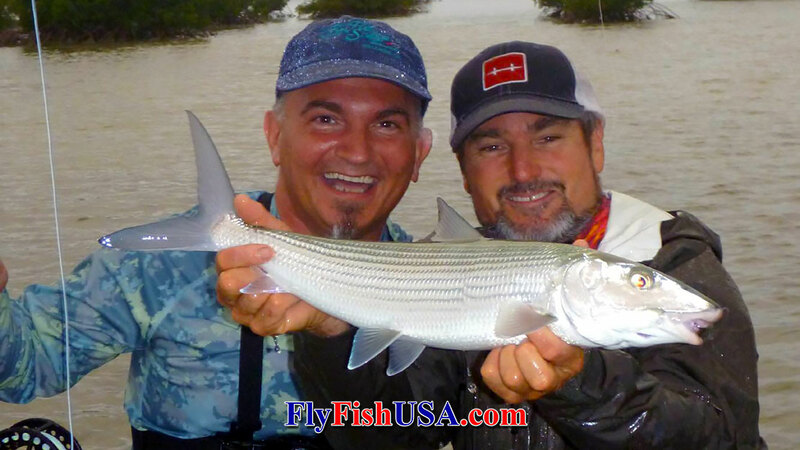 Cruising bonefish aren’t called silver ghosts for nothing! They are nearly invisible and very difficult to spot. You have to mentally slow down, walk slowly and look for drifting shadows. Hurriedly tromping along the flats like a city slicker spooks a lot of fish. You typically fish with one guide per two anglers, so eventually you’ll be fishing on your own and then fishing suddenly gets challenging. Being a somewhat focused individual at first it was hard for me to appreciate the little things like the warm water swirling around my legs, the dizzying array of green and blue tropical colors and the smell of the salt air, but eventually I experienced a change in latitude and my sight fishing game came together. It seemed like every time I slowed down and let things happen, a bonefish would magically appear. Cuba may be on of the most exotic places in the western hemisphere that is actually safe and civilized to go to, especially when you are camped in a mother-ship fifty miles off-shore. Only about ninety miles south of Florida, Cuba might as well be on another planet. A couple of times before the civil ware and the Spanish American War, Cuba nearly became part of the United Sates. We or the Cubans managed to screw it up every time. So Cuba evolved as an adversary and was shunned by us. However, the bonefish don't care. They like Americans better than most other Cubans. Cubans have done a great job of protecting their bonefish where we were, which is called Jardines de la Reina (Gardens of the Queen) named by Christopher Columbus for Queen Isabella. 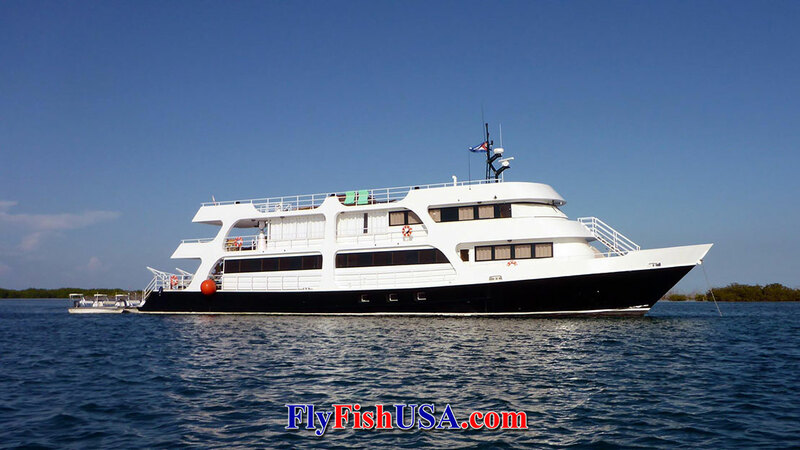 The Avalon II is perfect accommodations and the fishery is very exclusive. 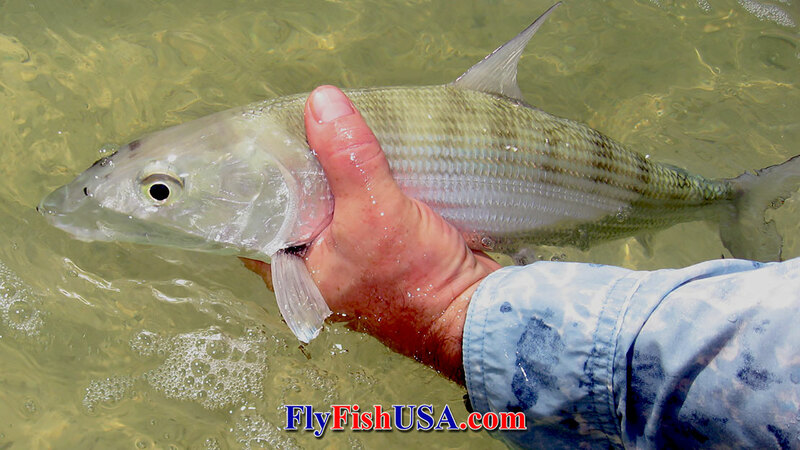 Bonefish here are larger than average with some truly huge ones available. We found multiple schools every day and got lots of shots, and many hook-ups. For us, it might have been the most consistent bonefishing we have experinced where double digit bonefish were available. A week long trip here is spendy though, coming in over eight grand for a week. Hawaii offers some of the largest ans most challenging bonefish anywhere on the planet. Some may be nearly twenty pounds. The fish pictured here is a Hawaiian Bonefish, but a smaller one. Allegedly the sport caught state record bonefish was 18-pounds and the larges netted bonefish was 24-pounds. Hawaiian flats aren't large and the setting might not be exactly pristine, but Hawaii is easy and inexpensive to get to. And it is one of the most popular tourist destinations in the world. Since your family is probably going to drag you along to Hawaii anyway, why not take a fly rod with you. Give Mike Hennessy a call at: Hawaii On The Fly, and set up a day on the water , or several days.